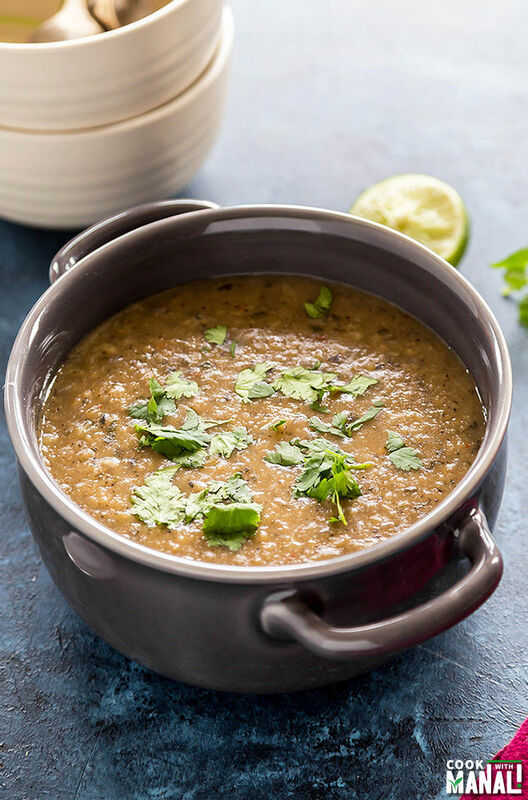 Instant Pot Mediterranean Lentil Soup is comforting, flavorsome, vegan & gluten-free. 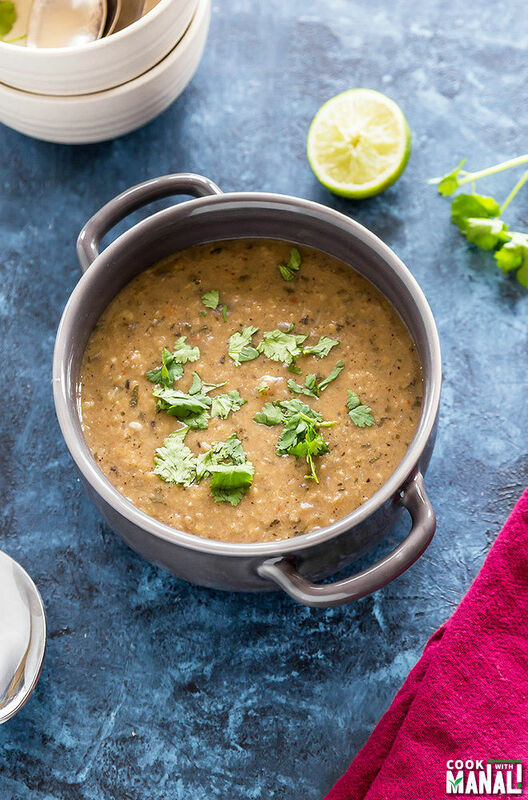 Made in the instant pot, this soup comes together in less than 30 minutes. It’s pretty hot where I am right now so I don’t know how exactly I feel about sharing a soup recipe today. But if you ask me, I am always up for soup. Whether it’s 100 F outside or 40 F, soups are on my dinner menu throughout the year. This Mediterranean Lentil Soup is one of my absolute favorites. 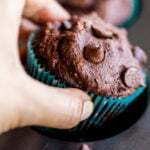 It’s super easy to make, packed with flavors and is also vegan! 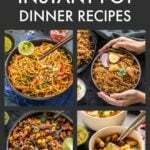 And the best part is that the version that I am sharing with you today is made in the Instant Pot! Do you guys like Mediterranean flavors? I love it! Maybe because it’s quite similar to Indian food in so many ways or maybe because it’s just plain delicious 😉 Either way they have tons of vegetarian options which is one more reason why I love it. It’s something we definitely eat once a week. We have this little Mediterranean cafe near our place and we usually get the lentil soup with a side of pita and baba ganoush or hummus for a quick dinner. It’s so delicious and so satisfying. Since we love the soup a lot, I also make it quite often at home. And this time I thought of using my Instant Pot to make the whole process extra quick! Mediterranean food is pretty flavorful, just like Indian food. So we have lots of spices and herbs going on here – cumin, coriander, sumac, parsley and mint. I would strongly recommend to not skip any of these especially Sumac. Sumac has a sour taste and it’s widely used in Mediterranean cooking to sprinkle over salads, kebabs etc. before serving. It’s also used in dressings and rubs and it imparts a wonderful flavor to this lentil soup. I would have added some fresh parsley here but since I didn’t have it in my refrigerator the day I made this soup, I opted for dried parsley and garnished the soup with fresh cilantro. There’s this amazing persian restaurant in Seattle and they serve the lentil soup mixed with little rice and it’s so good. You can do the same. If you think the soup isn’t filling enough, just add little boiled rice to it and then you have a complete meal in itself! 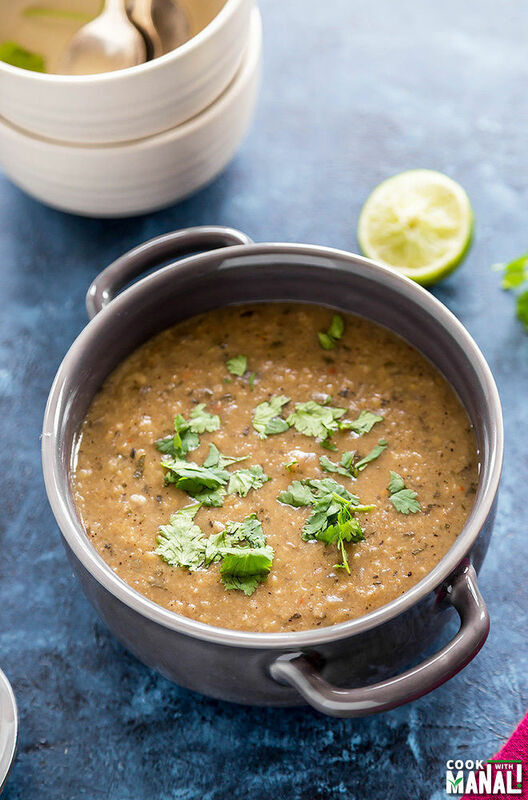 Serve this instant pot mediterranean lentil soup with a side of your favorite bread and enjoy! Add chopped garlic, ground cumin, ground coriander, ground sumac, red chili flakes, dried parsley, pinch of sugar and dried mint flakes. Cook for 1-2 minutes, stirring constantly. Add water (or vegetable broth) and give a stir. Add the lentils and also add salt and pepper. Stir to mix. Close the Instant Pot and set valve to sealing position. Cancel saute mode and press “Manual” button on your IP. Adjust the timing and set it to 8 minutes on high. Once 8 minutes are up, wait for 5 minutes and then do quick release. Stir the soup, add lime juice. 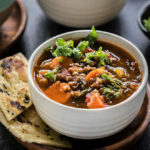 Serve the instant pot mediterranean lentil soup with a side of pita bread! * Garnish the soup with fresh parsley or cilantro. * Add more water for a thinner consistency of soup. * You can make this soup on the stove top too, it would take around 20-25 minutes for the lentils to cook till softened. 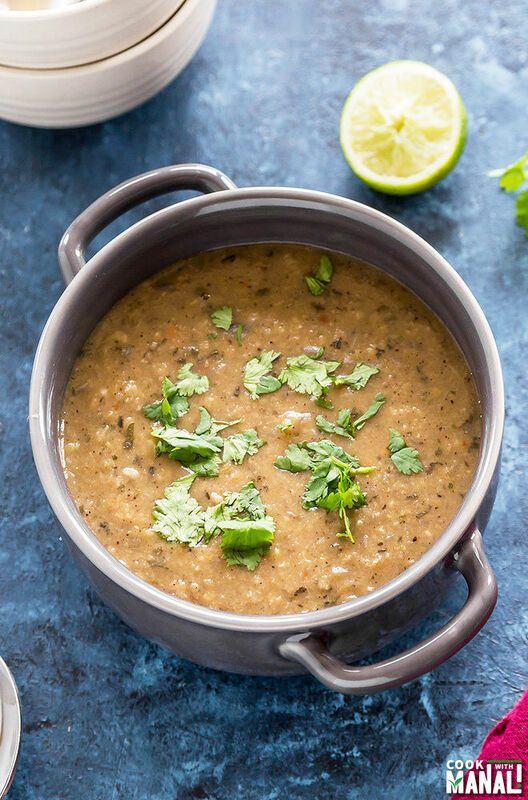 Instant Pot Mediterranean Lentil Soup is packed with tons of flavors and comes together in less than 30 minutes! Vegan & gluten-free. Press the saute button on your Instant Pot. Wait till it gets hot and then add olive oil to the pot. Add chopped garlic, ground cumin, ground coriander, ground sumac, red chili flakes, dried parsley, pinch of sugar and dried mint flakes. Cancel saute mode and press "Manual" button on your IP. Adjust the timing and set it to 8 minutes on high. Once 8 minutes are up, wait for 5 minutes and then do quick release. Serve the mediterranean lentil soup with a side of pita bread! What a pretty soup, Manali! 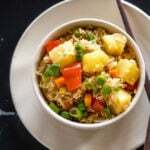 I’m debating on whether to get an instant pot or not, so I think I need to after seeing this recipe. Looks delicious! I am too, always up for the soup! Your lentil soup looks very creamy and comforting. I don’t have an Instant Pot but I could use my pressure cooker! 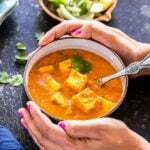 I love soup year round and this looks so delicious Manali! 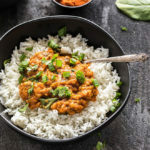 I love that you made this in an Instant Pot! 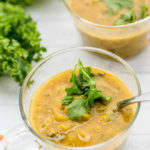 It’s still dark and rainy here so we are still loving soup recipes! Those instant pots sure make cooking quick! This soup looks lovely and since it’s still rainy here, it’s another soup day for us! I love Mediterranean flavors and this soup would be most welcomed on a day that’s 100 degrees or 20, which, by the way, it was 35 this morning! So bring on the lentil soup! Which is the Mediterranean cafe in Seattle? The one near my place is called Garlic Crush..my favorite restaurant in Seattle serving Mediterranean food is Petra! Garlic crush is our favorite and wanted to replicate it.. I have tried so many versions of it and was not very successful. Tried your recipe and it turned out good.. thanks Manali! Welcome Gowri, glad you liked it. This soup is closer to the one we get at Petra! We just traveled to Seattle a few weeks ago and tried Petra! We have been looking for a recipe for their red lentil soup. We LOVED it and want to go back there just for the food. 🙂 Thanks for posting. Excited to try this! I wish I would have tripled this recipe. It is so good! Thank you,I am glad you liked! This looks delicious and similar to a favorite at a local (East Coast) mediterranean restaurant. Would like to know if you have suggestions for multiplying this recipe to feed 6-8 people or more for leftovers 🙂 Using 8Q IP Thanks! You can mulitply it 4 times..use 2 cup lentils and around 6 cups water..3 times all the spices.. less if you don’t like heat..should work! cooking time should still remain same…maybe add a minute or two if you are not too sure..
Do you think I can use green lentils instead? I have a lot in my pantry but no red lentils. you can use green lentils, I am just not sure if they would cook in the same amount of time.. give it a go and see! Delicious soup! Very fragrant and spicy, but not a hot type of spicy. It was tasted more similar to lentil soup served at Mediterranean restaurants than any other recipe I’ve tried. I used lemon pepper as a substitute for ground sumac (which proved impossible to find in my metro area!). Next time I will double or triple the recipe – this made enough for two of us each have a large bowl and have a small bowl leftover. I am glad to know that Molly 🙂 I like the addition of lemon pepper, bet it tasted great in the soup! I was wondering what restaurant in Seattle you mentioned? I live not far from Seattle and am always up to try new places. Im also excited to try this recipe. I tripled the recipe and used green lentils because that’s what I had. We’re having a hot spell so don’t want to heat up the kitchen, but nursing a cold so want soup. This came out delicious but the lentils came out a little overcooked I think because I didn’t rescue them from the quick release quick enough, or perhaps green lentils cook different. I don’t have a lot of experience with lentils,nso don’t know. Will be using this recipe in the future! Oh, and I added chopped carrots. I just made this soup and it is phenomenal. The flavours blend so well together. I am sorry I didn’t double or triple batch it. I definitely will next time. 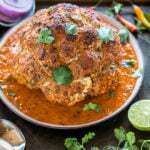 Thank you Manali for sharing this recipe! This was great but note that it only makes 2 servings!😳 I made some basmati rice and put a few scoops of soup on it per person and served with fresh crusty bread and we fed 4 of us! HI there! Wanting to try this – did you use canned lentils or soaked dry lentils? Hi Susan..I used dry lentils but they were not soaked..These are red lentils and they cook pretty quickly in the Instant Pot..no need to soak! those spices give this soup such a wonderful flavor, isn’t it? 🙂 So glad you enjoyed it Josh! 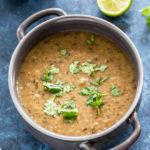 This is my most favourite lentil soup! I have cooked it multiple times already. I cook it in a simple heavy pot and it is great. Love the sumac addition!